Seasonal Wreaths & Garlands | Collections Etc. Whether you’re gearing up for the holidays or simply want to add a delightful touch to your home, there’s no better way to do it than with the wreaths and garlands at Collections Etc. 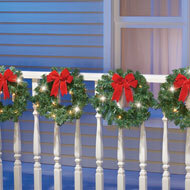 A wreath or garland placed on your front door or near the entryway adds an instant welcoming touch for all who enter. They’re also a fabulous way to showcase your style as well as the changing seasons. Our spring and summertime designs feature fabulous florals in all colors and styles. Choose from wreaths crafted from a single flower, such as daisies, tulips and roses, or opt for one bursting with an astonishing array of different blossoms. Select greenery or twigs in the background, along with adorable details that range from hummingbirds and butterflies to birdhouses and different wreath shapes. Your fall and winter wreath and garland choices are just as charming. Things like autumn leaves are an all-time favorite for cooler months, as are wreaths and garland that come complete with pinecones or autumnal flowers like mums. 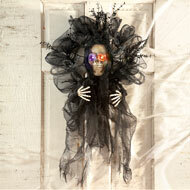 Our assortments for the fall and winter holidays are especially popular, and you can find enchanting Collections Etc. décor that aligns with the most familiar favorites. 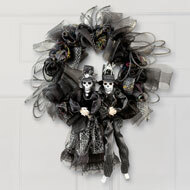 Christmas wreaths and garlands are among our top-selling items, but so are our frightfully adorable Halloween styles crafted with details like skeletons, pumpkins, ornaments and eye-catching holiday hues. Built-in lights are an added perk for a number of our choices, providing you with seasonal charm that literally lights up a room. Many of the offerings are also suitable for outdoor use, making your home a happy haven both inside and out. As with all items from Collections Etc., our wreaths and garland come with easy returns, terrific customer service and great value. Add a welcoming touch to your home today. 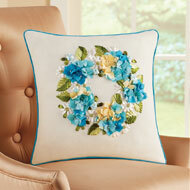 This delightful pillow features a wreath of beautifully colored 3-dimensional flowers with pearl accents in shades of blue, sage and white atop an ivory background with a blue border. Zipper at the bottom. Hand wash. Polyester; imported. Measures 16"Sq.